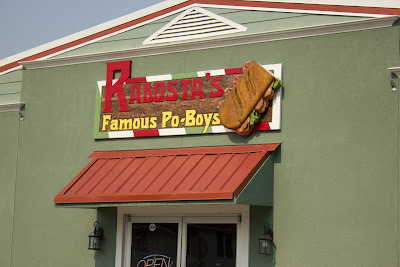 After my visit to the Abita Brewery, and my 23.83 mile jaunt across Lake Pontchartrain from Abita Springs, I decided to keep with my ritual on every trip to New Orleans and go straight for a Roast Beef Po-Boy! I’ve heard good things about Radosta’s in old Metarie, so that is where I headed. Tucked away on a neighborhood street, it took a little looking to find. Although it was slow when I came in, I got the feeling right away that this is the kind of joint that locals in the neighborhood pay a strong allegiance to. The folks that own and run it, are just as nice as can be. 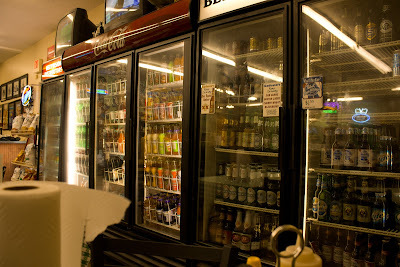 I ordered at the deli counter, the gentleman behind the counter took my order, and when I asked about a drink he said, “Just help yourself to anything you like from the coolers, just like you’re at home. You can pay on the way out.” I liked that. I grabbed an ice cold Abita Jockamo IPA, because hell, why break the theme of the day. I had a seat to wait for my order and snap a few shots of the interior. I love neighborhood places like this, and it always makes me jealous that I don’t have one like it. 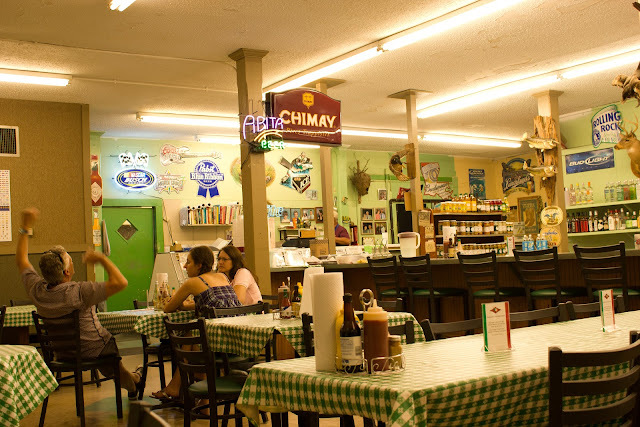 A father and son grabbing a Po boy and a soda, presumably after school, another family relaxing and talking after a late lunch. The counterman casually checking the score on the TV as he prepares my sandwich. No stress, no mess. Business as usual. My food arrived a few minutes later, a dressed Roast Beef Po-Boy, and a cup of Gumbo. 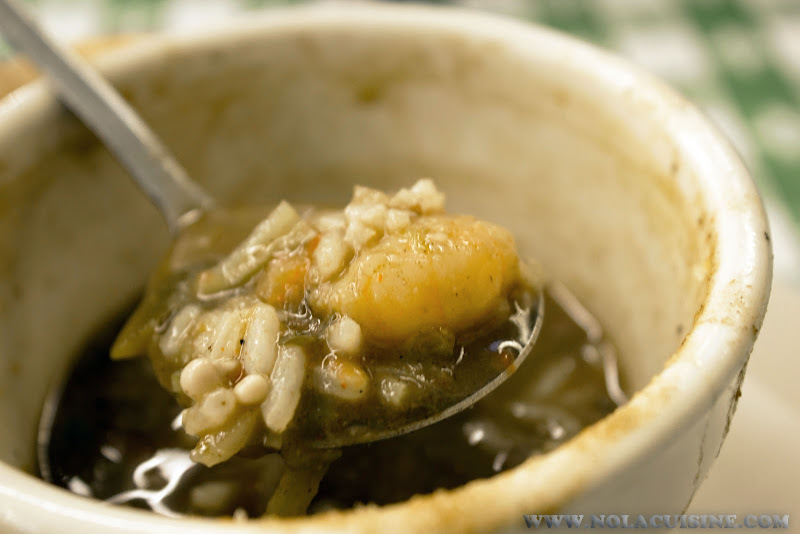 I started with the Gumbo, and I have to tell you, I was floored, just delicious. Nothing crazy, or new, just a well made, well seasoned File Gumbo. I loved it. 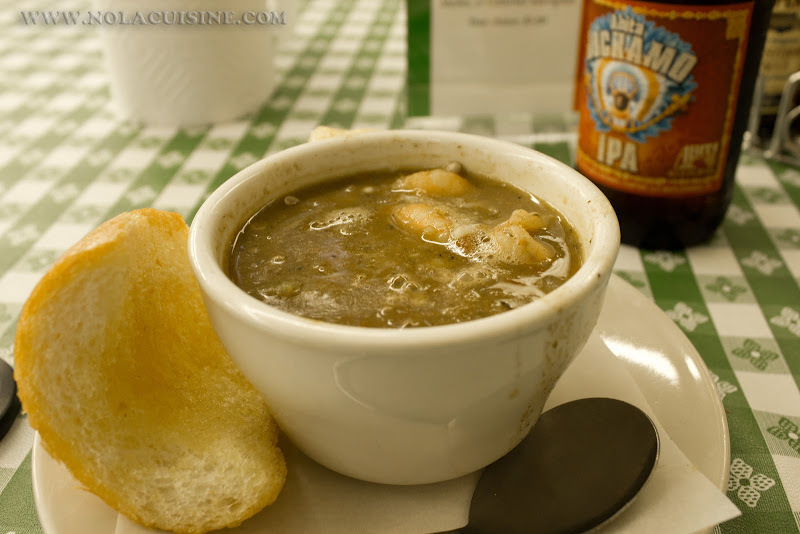 Honestly, I don’t usually order a Gumbo at restaurants, because quite frankly, I like my own. But I was glad I did on this occasion, it really hit the spot. 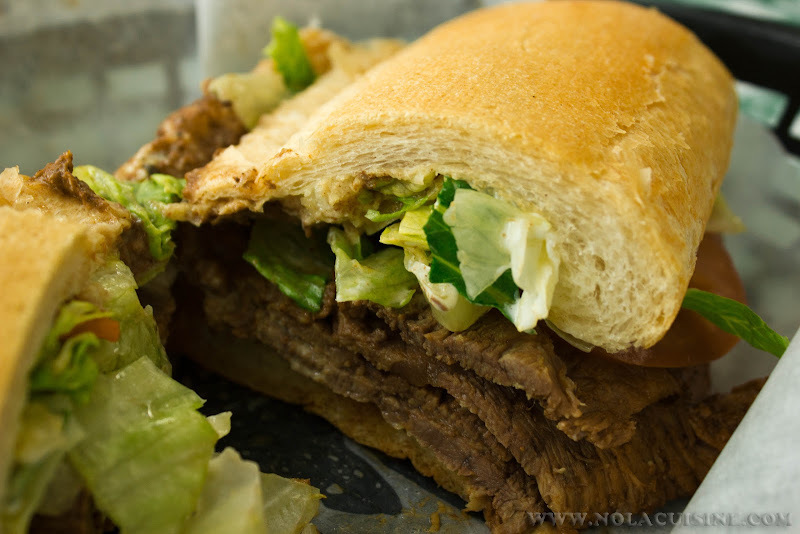 On to the main attraction, the Roast Beef Po-Boy. Very good, wonderful beef, tender with good flavor! Good buttered and toasted French Bread. Dressed. Generally I like my Roast Beef Po Boys a little more sloppy, lots of gravy and mayo. This one was more about the beef itself which was very good and a very generous portion! After stuffing myself I went to the counter to pay, had some nice conversation with the delightful gal tending the register, I presume one of the owners, and went on my way, fat and happy! Smart cooks never throw away a chicken carcass, or god forbid, a Thanksgiving Turkey carcass! I always look forward to post Thanksgiving Turkey Bone Gumbo, which is a wonderful way to utilize the meat, carcass, and in my case, dressing. In place of the rice I like to serve this with leftover dressing, which is just incredible with this Thanksgiving flavor packed Gumbo! Heat the oil in a cast iron dutch oven over medium heat. Whisk in the flour to make a milk chocolate colored Roux (making a Roux). Add the Andouille, 1 Tbsp of Seasoning, and 3/4 of the Holy Trinity, cook, stirring often, for about ten minutes or until the vegetables soften. Add the cold stock, remaining seasoning, and Garlic. Bring to a Boil. Bring this down to a simmer and let it go for at least 2 hours, stirring occasionally. About 10-15 minutes before you’re ready to serve, add the leftover Turkey to the pot. Add the Worcestershire, Hot Sauce, and 1/2 of the Green Onions. Serve with hot leftover dressing, crusty French Bread, and a good cold beer (I like Dixie or Abita Amber). Break apart the Turkey carcass and cover by 2 inches with cold water in a large stock pot. Slowly bring it up to almost a boil. Skim off any scum and fat that rises to the surface. Reduce the heat and maintain the heat at a bare simmer, continut to skim. Simmer for 4-6 hours. In the last hour add, a small bunch of fresh Thyme, 1 bunch of parsley stems. Strain through a fine mesh strainer, discard the solids. 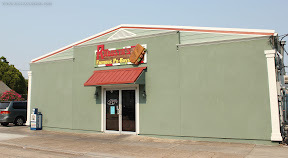 Be sure and visit my ever growing Index of Creole & Cajun Recipes! Heat the oil in a cast iron dutch oven over medium heat. Whisk in the flour and cook to make a milk chocolate Roux (making a Roux). Add the Andouille, 1 Tbsp of Seasoning, and 3/4 of the Holy Trinity, cook, stirring often, for about ten minutes or until the vegetables soften. Gradually whisk in the stock, then add the remaining seasoning, and Garlic. Bring to a Boil, then down to a simmer for at least 2 hours, stirring occasionally. Add the chicken and simmer until cooked through. About 10 minutes before youâ€™re ready to serve add the shrimp, cook until done, then add the oysters and cook until the edges curl. Add the Worcestershire, Hot Sauce, and 1/2 of the Green Onions. Serve with Creole Boiled Rice, crusty French Bread, and a good cold beer (I like Dixie or Abita Amber). Garnish with green onions, parsley, and Fil&#233 powder at the table. 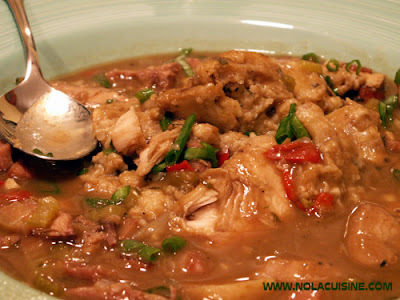 Be sure to check out my ever growing Index of Creole & Cajun Recipes.